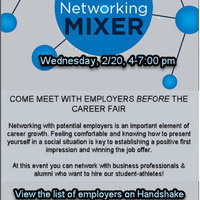 Students/athletes - come meet employers on-campus! Networking with potential employers is an important element of career growth. Feeling comfortable and knowing how to present yourself in a social situation is key to establishing a positive first impression and winning the job offer. This is a more intimate networking event with business professionals & alumni who want to hire our student-athletes! David's Bridal - Alterations Dept. A few more will be added, so be sure to check back! To ensure adequate staffing, please register your intent to attend any time during the 4-7 p.m. timeframe.